2008 New Year I was in Normandy visiting a French friend from the Erasmus (ESN) exchange program in Helsinki. 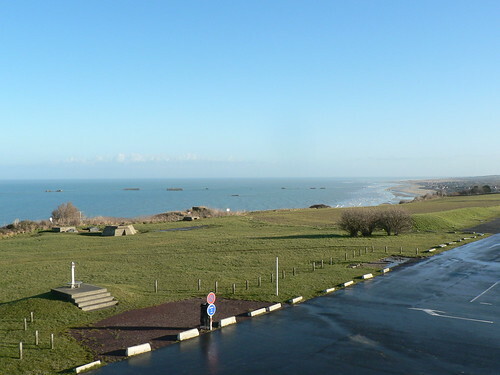 My ulterior motive was to feel out a little bit more about my grandfather's involvement in D-day, by examining those famous Normandy beaches. Unfortunately all I had to go on, was that the beach was called "Nan white". No one had heard of it when I went to a visitor centre! After researching a little, I think it's the Eastern part of Juno beach. Though my grandfather (Ernest Hendry) was a British soldier, he landed and fought alongside with Canadians! That I do know from my Dad. My grandfather kept his memos and maps carefully rolled up in some canvas, and my Dad and I only really got to see them when he died 20-odd years ago. My Dad was really proud of his father and he had all the material framed for display in our snooker room in Westville. Tragically over time all this historical detailed material faded under light. It's now sadly completely illegible. I am not quite sure how I am supposed to really feel or remember D-day. I know from my Dad that he never talked about it. Generally I had the feeling he was quite pissed off (to put it lightly) he was ever dragged into this mess. Something he didn't want to remember! I know he gained a lot of respect for his enemy at the time, Germany. So it made it easy for my Dad to marry a German girl (my mother) some time later.